Gourmet Jelly Belly Jelly Beans in a gift box. 50 flavours! 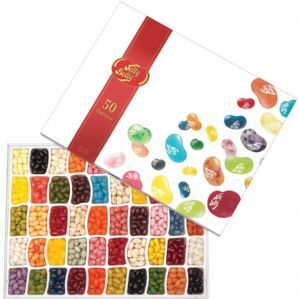 Jelly Belly Jelly Beans 50 Individual Flavours Gift Box 600g. An assortment of 50 individual Jelly Belly jelly bean flavours. This large box is 38cm x 29cm x 3cm. This ideal present contains 50 flavours in 50 seperate compartments. For the Jelly Belly aficionado - no other gourmet beans will do. ingredients: sugar, glucose syrup, modified corn starch, peach puree concentrate, acidity regulators: E297, E325, E330, E331; plum juice concentrate, natural and artificial flavourings, blueberry puree, coconut, pear juice concentrate, colours: E100, E102, E110, E129, E132, E133, E150d, E171; glazing agents: E901, E903, E904; lemon puree, tangerine juice concentrate, grapefruit jiuce concentrate, ascorbic acid, freeze dried strawberry powder, salt, tapioca dextrin. May contain Nuts. FAT FREE, GLUTEN FREE, GELATINE FREE.